Podcasting is becoming more and more popular. I thought I might share the various ways you can listen to the podcast on your Palm device. There are several ways to do it, and they fall in three different groups. 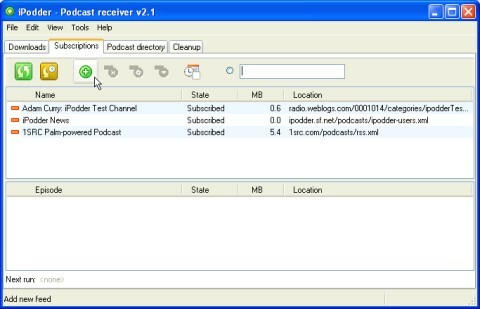 One group involves downloading the podcast to your computer and transferring the podcast to the Palm using one program like Quick News. 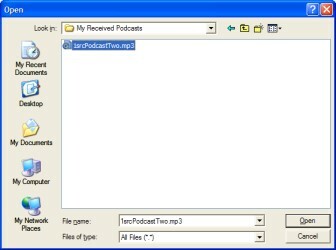 One group involves downloading the podcast to your computer and transferring the podcast to the Palm using two programs (one for downloading and one for transfering). For LifeDrive users, one of the applications is already bundled with the LifeDrive. The last group involves wirelessly downloading and/or streaming the podcast on your Palm. We will look at both of them. First, you will need to decide if you can play the podcast on your Palm. For the MP3 format (which is the default format for podcasts), you need a MP3 player compatible with the device you have and an external memory card with about 6 MB of memory available. Pocket Tunes is a popular MP3 player for Palm OS 5 devices. There are other MP3 players, such as Aeroplayer, Busker MP3 Player, MMPlayer, and TCPMP. For the chance the podcast uses the Kinoma format, you need the Kinoma Player and about 6 MB memory available on the Palm or on an external memory card. The Kinoma Player is free. Of course, the amount of available memory depends on the size of the file. The sizes I mention are guides for the 1SRC podcasts. There is a new program out for the Palm called Quick News that will download and HotSync podcasts to your Palm device using podcast feeds. 1SRC actually has a Podcast Feed that can be used with Quick News. Although large podcasts might take a while to transfer, it simpilies the entire process for Palm OS users. I highly recommend Quick News for getting and listening to podcasts. I plan on updating this guide to include Quick News in the near future. 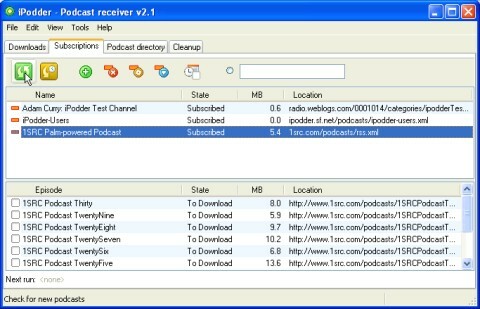 There are several different ways to download the podcast to your computer. 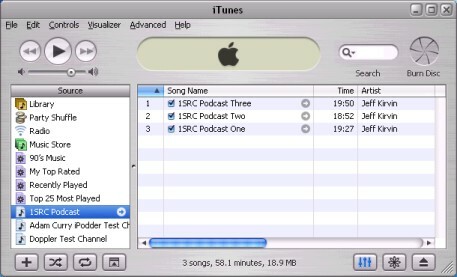 1SRC actually has a Podcast Feed that can be used with applications, such as iPodder, Doppler, or iTunes. Note: iTunes 4.9 was just released that supports podcast feeds. Any of these will give you the ability to automatically download the latest podcast to your computer when it becomes available. To setup and configure iPodder, view the section titled Configure iPodder. 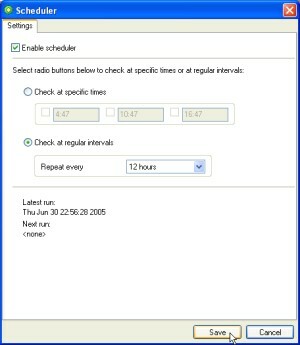 Note for PalmOne LifeDrive Users: Click here for a guide that sets up iTunes to synchronize Podcasts with your LifeDrive. If you already have iPodder or Doppler configured, you could do the same thing with the folder used to download podcasts. Another way to download the podcast to your computer is to save the MP3 file manually to your computer. Most browsers allow you to right-click on the link and save the file to your computer. For Internet Explorer users, the selection will be Save Target As... in the popup menu. For Mozilla Firefox users, the selection will be Save Link As... in the popup menu. You can download the Kinoma file to your computer in exactly the same way. Just remember to know where you saved the file because you will need to transfer it to your Palm. The links to the different file formats can be found in the 1SRC Podcast news article. Unfortunately, the Kinoma format for the 1SRC format is no longer supported at this time. Second, you need to transfer the downloaded file to your handheld. The easiest way to do this is to use the Install tool available with the Palm Desktop software. Newer versions of the software have a Quick Install tool. Either way, run the install tool and add the podcast. If you use the MP3 file format used in the 1SRC Podcast Feed, you will have to HotSync the podcast to an external memory card. If you use the Kinoma format, you can actually HotSync to an external memory card or to the internal memory of the Palm. Note: If using iPodder, go to the location configured in iPodder under the Preferences tab. The podcast should be added in the list as shown below. Click Done and HotSync. Of course, you could also use a card reader to transfer the file directly to the external memory card, but you have to know where the file goes. Most Palm audio players will find the podcast if you place the MP3 file in the \audio\ directory on the external memory card. If you are copying the Kinoma file to your external card, it needs to be placed in one of the following locations: \palm\programs\kinoma\, \palm\launcher\, \palm\programs\msfiles\, \dcim\, or the root directory. Click on the playlist button. Click on the add button (plus sign). Select URL at the top left of the screen. Enter the URL of the podcast, and click OK.
Click on play to connect and stream the podcast. Click at the top to pull up the menu. Select Play URL... from the menu choices. Enter the URL of the Kinoma file, and click on OK.
Kinoma will connect and start streaming the podcast. From iPodder web site, "iPodder is a media aggregator which automatically downloads podcasts to your computer or portable device based on a RSS feed, leaving you 'one-click-away' from the latest media feeds. The whole process is done on its own, so you don't have to select files, search for them or click links to download the media. All you do is specify some feeds and wait to get yourself the podcasts. All you have to do is decide what you are going to listen to." To configure iPodder for a 1SRC Podcast Feed, click on the green '+' icon as shown below. 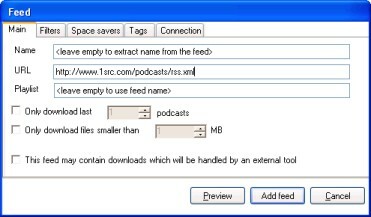 Then, enter http://www.1src.com/podcasts/rss.xml in the space provided and click on Save as shown below. It should show up in the list as shown below. Then, simply click on Check for new podcasts to check for new podcasts. If there are any new podcasts that have not been downloaded, it will be downloaded to the directory as defined under the General tab under Preferences. Note: To get to preferences, go to File -> Preferences. If you just want to download the latest podcast without downloading all of them, simply click on Catch-up. When using the Catch-Up button, you have the option to permanently skip the other podcasts that have not been downloaded or just this time. 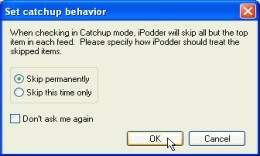 If you chose Skip permanently, it will not go back next time and download missing podcasts. If you chose Skip this time only, you can go back and download missing podcasts when you have more time. With iPodder, you can schedule the frequency that iPodder checks for new podcasts (click Scheduler button). In addition, you can choose where the new podcasts get downloaded (see Preferences, go to File -> Preferences). From Doppler web site, "Doppler is a podcast aggregator. With Doppler you can subscribe to RSS 2.0 feeds which contain enclosures. Doppler will download those enclosures and optionally add them to your preferred media player." After installing Doppler, it will prompt you where to download the podcasts. Then it will prompt you for your media player to listen to your podcasts. After installation, you will need to run Doppler. To configure Doppler for a 1SRC Podcast Feed, click on Add Feed. Enter http://www.1src.com/podcasts/rss.xml in the URL field as shown below. Then, click on Add Feed. It should show up in the list as shown below. Then, simply click on Retrieve Now to check for new podcasts. If there is a new podcast, it will be downloaded to the directory as configured when you installed Doppler. To check this setting, use the menu for the download location you have setup (Tools -> Options). 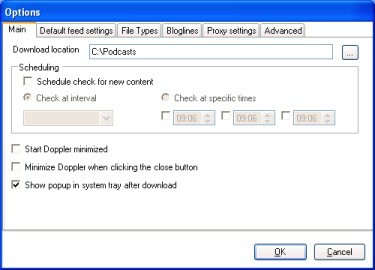 With Doppler, you can schedule the frequency that Doppler checks for new podcasts (Tools -> Options). Here is a screen shot where Doppler copied the podcasts into iTunes.